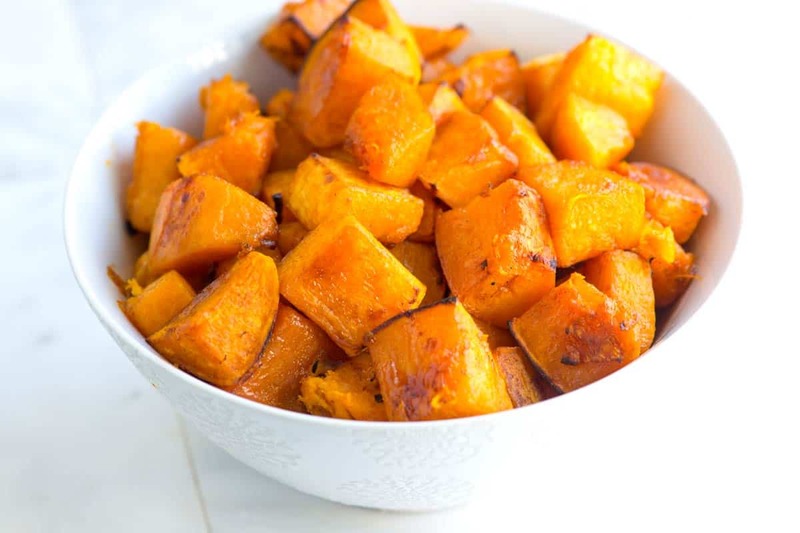 Simple roasted butternut squash recipe with cinnamon, brown sugar and a little cayenne. Jump to the Roasted Butternut Squash Recipe or watch our quick video showing you how we make it. 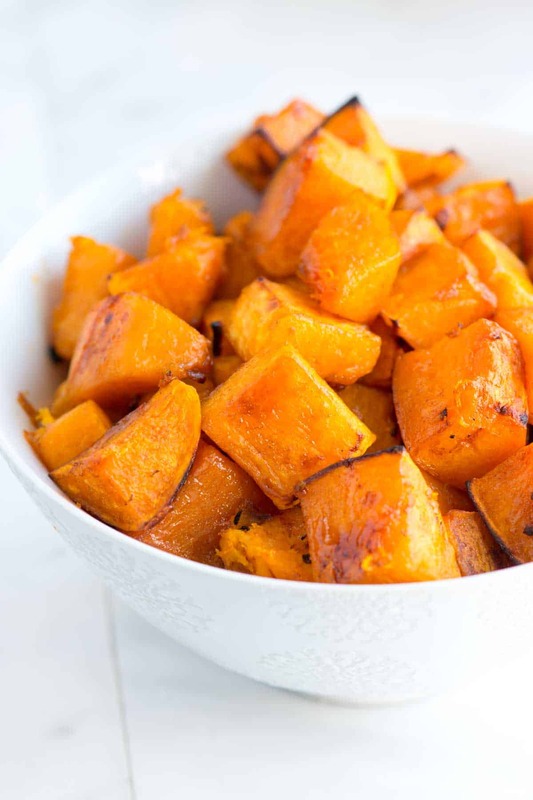 Butternut squash is roasted until tender and lightly caramelized. Cinnamon and cayenne add warmth while brown sugar sweetens things up a little. During the fall and winter, we find ourselves making a batch of roasted butternut squash almost weekly. It’s a perfect side, can be served cold on top of salads for lunch and is delicious as a snack with a little ketchup on the side. 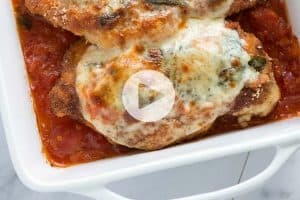 Need some inspiration for dinner? Try serving roasted butternut squash with our Rosemary Roasted Chicken or Perfectly Roasted Pork Tenderloin with Apples. 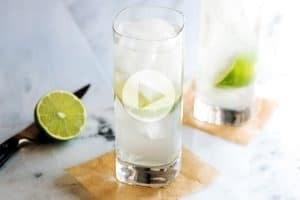 Just click the links for recipes. Try to cut the squash into evenly sized pieces. We know cutting up winter squash, especially butternut squash, can be tricky. (Don’t worry, in our recipe below, we share how we do it). We find that separating the thinner end from the round, wider end makes things much easier. In the recipe below, we call for 1-inch cubes. You could choose to make the chunks smaller or larger, just keep everything similar in size. This way, all the squash pieces roast evenly. As for peeling, you could leave the peel on. We prefer to remove it, but it’s fine to eat and some prefer the chewiness of the peel when left to roast. Don’t crowd the squash. Use two baking sheets. When you’re roasting vegetables, it’s important to give them a little space. Without some room, vegetables tend to steam instead of roast. When that happens, you can say good-bye to the golden brown and caramelized edges we love so much. (We hate extra dishes just as much as anyone, by the way. That’s why we line the baking sheets with foil first). Roast butternut squash at a high temperature. After trying a few different oven temperatures, we’ve settled on 425 degrees F. The squash becomes tender and the edges get a chance to brown a little. If you’re roasting something else, say chicken, at the same time you do have some leeway. Stick close to 425 degrees F and you should be just fine. We love roasting all kinds of vegetables, here are three of our favorites: Cheesy Roasted Cauliflower with Lemon, this Roasted Carrots with Parsley Butter and Coconut Oil Roasted Sweet Potatoes with Pecans. For more easy winter squash recipes, check out our Brown Sugar Roasted Acorn Squash Recipe, our Parmesan Lemon Baked Spaghetti Squash with Chicken, Easy Roasted Butternut Squash Soup and our Homemade Pumpkin Puree Recipe. Not only is roasted butternut squash a perfect side dish, it’s perfect to add to rice bowls or to top hearty salads. We enjoy it cold and often save some for the following day to add to salad for lunch. If you’ve got lots leftover, make soup. Throw leftover roasted squash into a blender with a splash or two of stock and blend. This recipe can be used for other varieties of winter squash. Simply substitute other winter squash varieties for butternut squash in our recipe below. Heat oven to 425 degrees F and line two large baking sheets with aluminum foil. Toss squash cubes with olive oil, brown sugar, cinnamon, salt and the cayenne until well coated. Tumble coated squash onto baking sheets and spread into one layer. Try not to crowd them too much or else they will not brown. Bake squash, turning once and rotating pans once, until edges are lightly browned and centers are tender; 40 to 45 minutes. (Since ovens can often run hotter than you have heated them to, check the squash every so often to make sure they are not roasting quicker than expected). 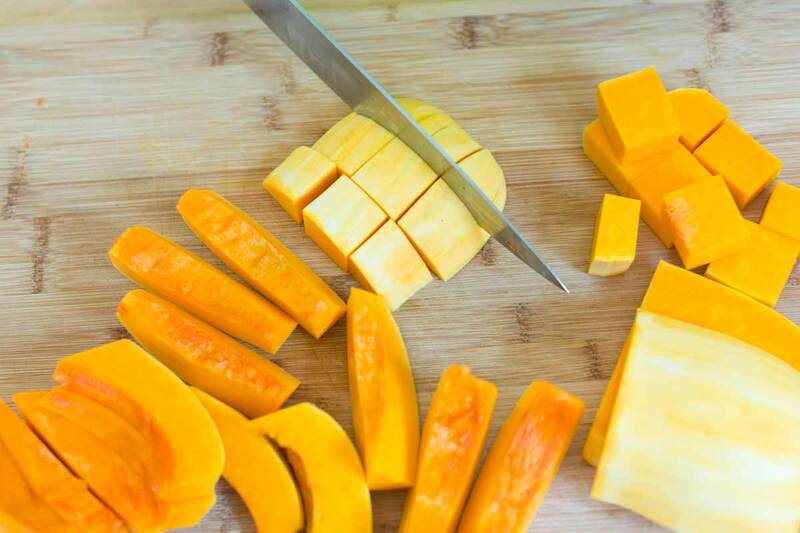 How to Cut Butternut Squash into Cubes: Cut off the stem and bottom ends of the squash so both ends are flat. Slice the squash in half, just where the thinner end begins to widen. Use a heavy-duty peeler to peel away the skin. If you notice green streaks remaining on the squash as you peel, peel those away as well until only orange flesh remains (they can be a little tough). Cut the larger end in half and spoon out the seeds. (Save the seeds – look for instructions for how to roast them below). Cut each piece into 1-inch-thick sticks then slice into 1-inch cubes. How to Roast Butternut Squash Seeds: Remove pulp and fibrous threads from seeds. Simmer seeds in salted water for 10 minutes. Drain and pat dry. Toss seeds with olive oil and lightly season with salt. Roast in a 325 degree F oven for 15 to 20 minutes. The seeds will not change much in color, but will crunch when done. GREAT recipe. Have cooked it twice now, had no cayenne so used crushed red pepper flakes this time. Actually worked well. This will remain a favorite and I’m glad to know parchment paper will work. I always worry that a bit of foil will find its way into someone’s mouth! Also thanks loads for showing how to prep squash. I’ll be trying more of your recipes, for sure! Would like to prepare in the morning and reheat for late afternoon serving. This keeps well in the fridge. 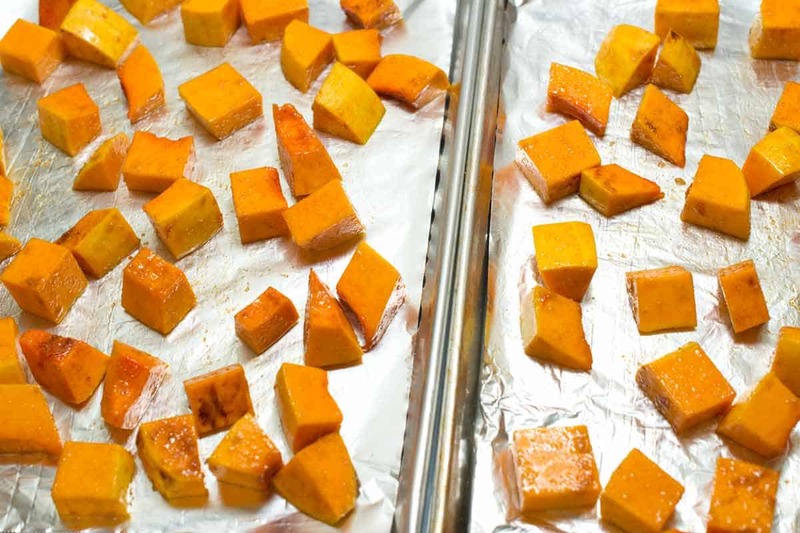 To reheat, place the squash onto a baking sheet and bake in the oven until warm. Made this, Joanne and it was super good! We did not use aluminum foil as written in this recipe; but instead used parchment paper. 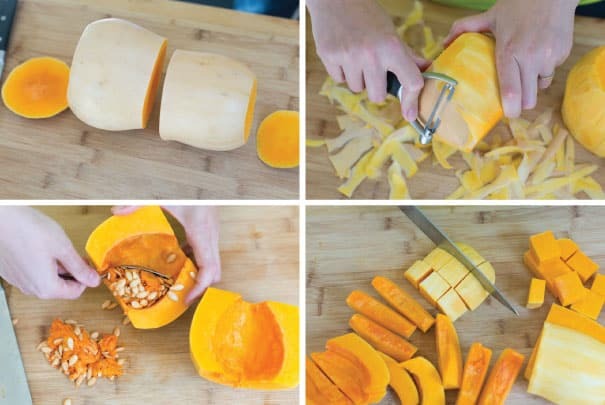 Love the tip you included on how to easily cut butternut squash. 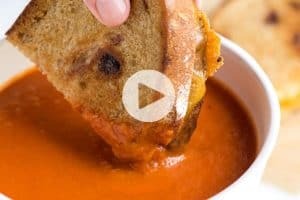 It truly made things easier when following this recipe; there was no need to search for some trick and tips because you included how to cut squash up already. Thank you! Made this – in combination with some roasted potatoes and sweet (not bell) red pepper. This squash was the hit of the evening. Made as directed but 425 was too high for my oven. I set 20min to turn and it was done already. For the second batch I turned the oven down to 400 and cooked for 30min without turning. They came out perfectly! I’ll definitely try this again, it was delicious! Hi Carrie, You might actually get away with tossing the frozen cubes into the oven. If this prevents the squash from browning around the edges, you can thaw them first, pat dray and then mix with the other ingredients. Made as written (less the cayenne) for Thanksgiving. It was a hit! Very yummy. Hi…I love this squash but have always served it like mashed potatoes or soup!! 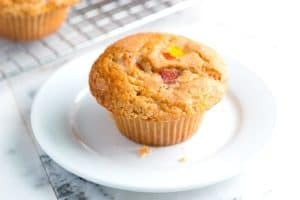 I want to make it your way and want to make it today and take it to a friend’s house tomorrow…any ideas on how to reheat it…or does it have to be served right away? Hoping to hear from you soon!! Hi Linda, To reheat the squash, throw it into a hot oven for a few minutes to warm and crisp up. This is great as written. Just made it the second time. The first time I brought pre cubed butternut squash, the second time I imposed on my husband to peel and cube the squash. Both Turned out were great but the latter was just a touch better. I made this tonight, and it was absolutely delicious! We were roasting chicken at 375, so we roasted the butternut squash for one hour. It was perfect.